Until a few years ago, I thought I had bonefishing pretty much down pat. Because of my job at Angling Destinations, I've been lucky enough to fish for bones almost everywhere they are found. I've caught literally thousands of bonefish. I've especially loved the pursuit of uneducated fish in remote places where the bones had never seen a fly. Sometimes, it was absurdly easy. But unvisited atolls with uneducated fish do not stay that way forever. Not only do unvisited atolls tend to get visited, but it doesn't take long for the fish, especially the big fish, to wise up. A few days of pressure could really change a flat and I often left an area with the big fish being significantly harder to catch than when I arrived. Whether it was the "early days" in the Seychelles, French Polynesia, the Bahamas, Los Roques, Belize or Mexico, the big bruisers always seemed to learn fast. I guess bonefish don't get big without also being smart. I began noticing that at times, even on lightly pressured flats, I'd get a fly well in front of a big fish, begin my stripping when the fish approached only to watch the fish ignore my fly or blow up and leave the flats. I was beginning to question the conventional strip. It didn't matter whether it was Belize, Los Roques or the Bahamas, big bonefish didn't respond well to the time-honored retrieve. Over time, I started moving the fly not only less and less, but slower and slower. But I had not developed any sort of unified technique. Then, about five years ago, I met the guides from Water Cay Lodge on Grand Bahama Island and let me just say "my horizons expanded". 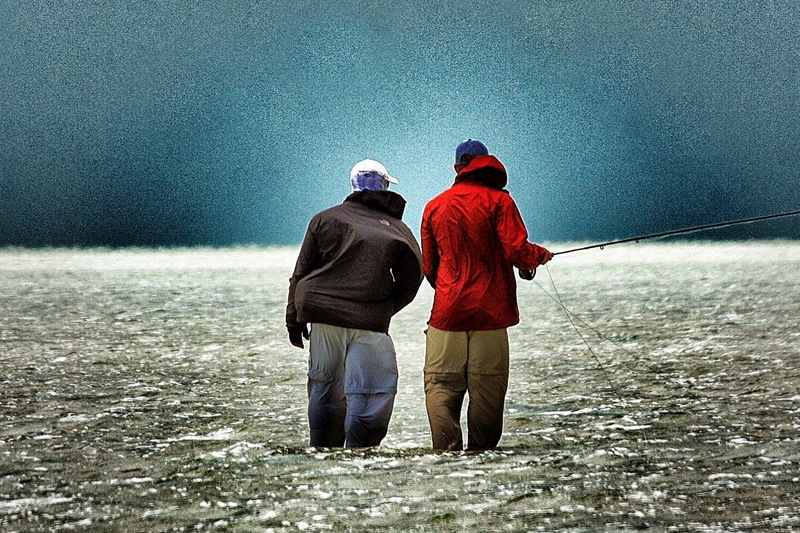 Fishing at Water Cay is a learning experience for even the most seasoned of anglers. 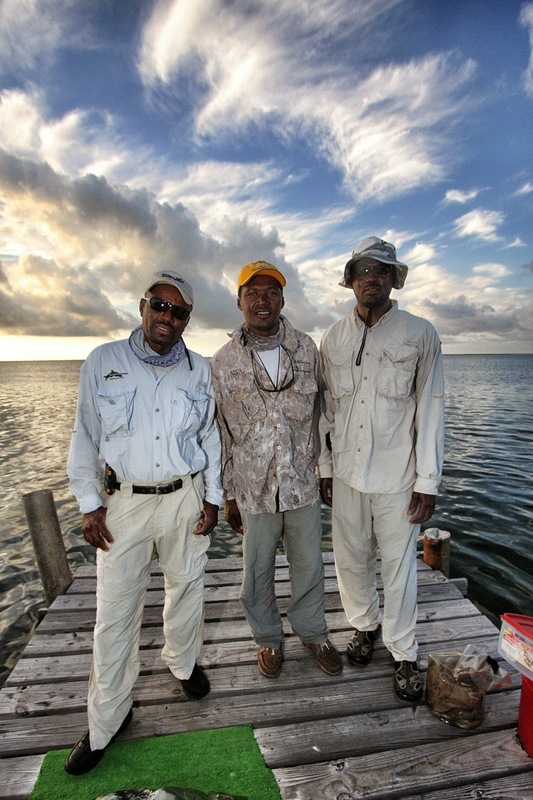 All three of the guides are analytical, good at communicating their methods and have some of the best bonefish eyes I have ever seen. But a warning, if you are the know-it-all type that doesn't want to try something new, don’t go to Water Cay. But if you want to get better and put some new arrows in your angling quiver, Water Cay should be near the top on your bucket list. If you can surrender your ego at the Water Cay dock, you will catch fish and more importantly, learn new methods to catch fish. Get the pointy thing in front of the fish. To do this you must observe and read the behavior of the fish. If they are moving fast, you want to try and get the fly well in front of them and let them swim up to it. If they are settled down in shallow water, a closer presentation (that doesn't spook the fish) is the goal. If they have their noses buried in the bottom, you may have to put the fly right on the fish. This proper distance changes frequently depending on weather, wind, water temps, water depth and the fish's behavior etc. The key is to present the fly so the fish sees it. To do this you need the heaviest fly you can get away with depending on the water depth you are fishing. HINT: Come to Water Cay equipped with large lead eye, small lead eye, large bead chain and small bead chain flies. And be ready to change your fly as the conditions dictate. At times, the guides will tell you to hit the fish on the nose. I know, I know... this can spook fish and it will at times. But, a good percentage of the time, IF YOU DON”T MOVE THE FLY, the fish will flinch and then come back to the fly. If you cast too long the guide may have you strip quickly to get your fly within the bone’s field of vision. He is not having you repeatedly strip to entice the fish. He is getting you to retrieve your fly to a point where the fish can see it. When he says stop stripping... STOP! HINT: Once the fly has settled, get the slack out of your line so you have a direct connection to your fly. If you are fishing from a drifting boat or in a tidal current, slack can form quickly. 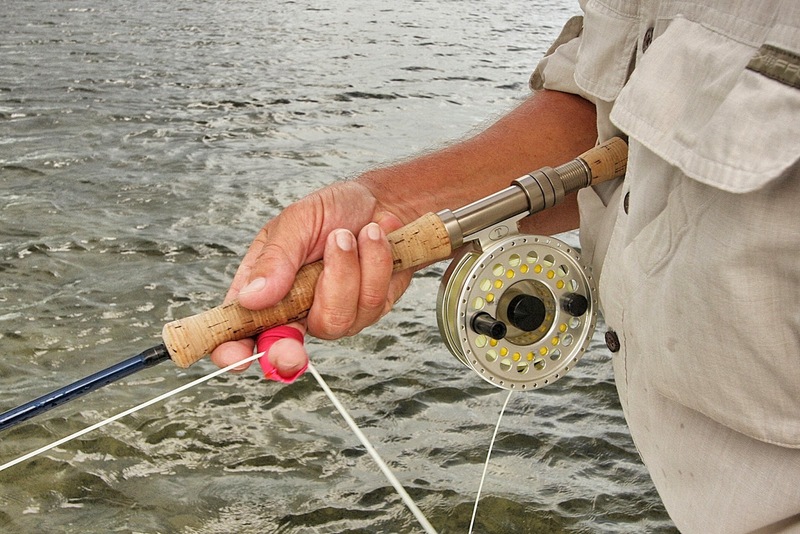 In these situations, you must get the slack out of your line without moving the fly. To summarize so far: Get the fish to see your fly, then don’t move it. 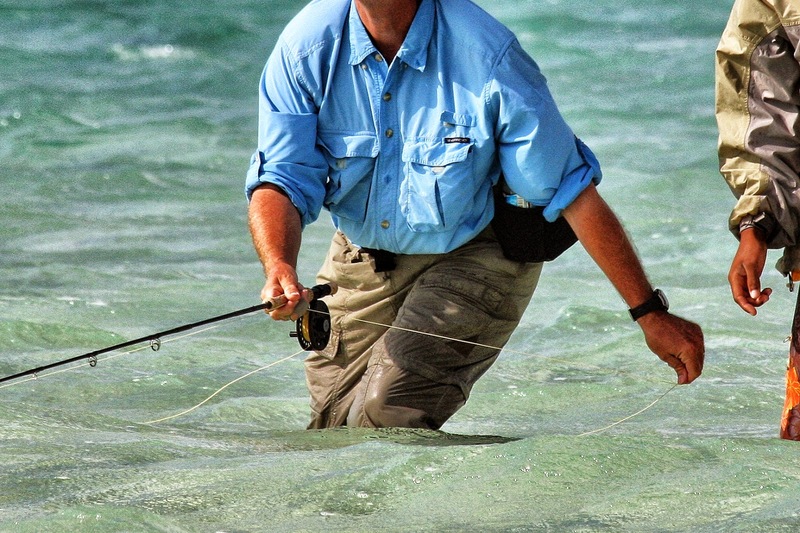 This is the technique most successful anglers use with permit so it is not a big stretch to use it with bonefish... especially big or wary bonefish. HINT: Keep your rod tip at the water’s surface when stripping. This will both keep the weight of the fly line from pulling the fly and keep the fly line from slapping noisily on the water’s surface. If you make a less than perfect cast or you think the fish has not seen the fly, make one slow strip. Watch the fish. If the fish sees the fly, STOP MOVING THE FLY. Only move the fly again if the fish appears to have not seen the fly or if he shows interest then veers off. The Water Cay Method requires you to be very observant and study the bone's behavior. The guides want you to react to the behavior of the fish and not just blindly retrieve. Sometimes bonefish will study a fly for a long time before they decide to eat it. If you strip again, more often than not, they will blow up and be gone. If a fish tips up or obviously eats your fly, make one long SLOW, as in S-L-O-W, strip. You want to just come tight to the fish. To put this hookset method another way, a traditional quick strip-strike will often spook the fish and if not, this strip moves the fly unnaturally. The fish immediately know something is wrong. They may not spook, but they also will not eat. The show is over! Again, all you want to do is slowly come tight. Yes, it takes practice, but it also takes a willingness to try something new, as well as great discipline. It may seem simple, but achieving a very slow strip (or no strip at all) can be quite challenging especially when a double-digit bone has followed or tipped up on your fly. Make the one long SLOW setting strip with your arm straight (elbow locked) and your stripping hand passing by your hip. This takes up much more line than pulling your fly into your body with a bent elbow. When you feel the line come tight, all you need to do then is flick your wrist back and the fish is on. 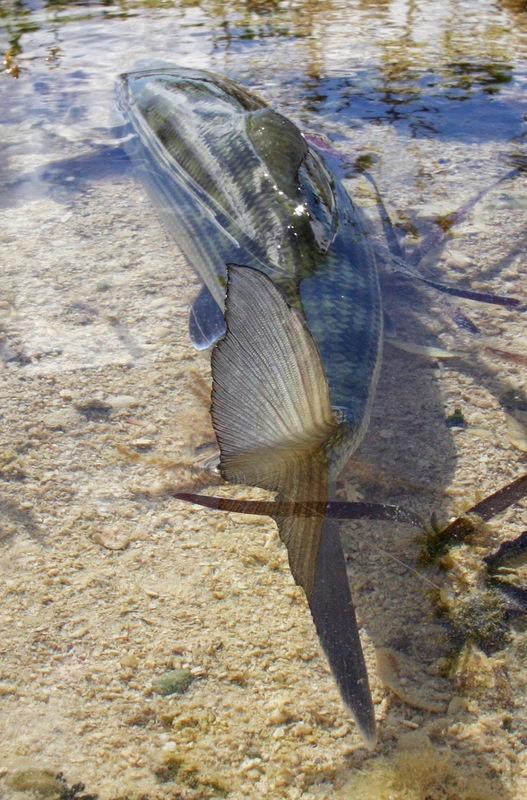 If you are an angler who uses the conventional "strip it until it eats" technique, the Water Cay Method may seem difficult to achieve... especially at first. But, stick with it! This method works well anywhere in the world and is especially effective on big wary fish. If you notice your conventional presentation of predicting the path of the fish, casting well ahead and letting the fly sink, then stripping when the fish gets to you fly with a series of quick strips (quick strip, pause, quick strip etc.) is not working or is spooking fish, you might want to give this method a try. Thanks also for the continued updates of fresh info here! Love it. Good stuff. I have the same issues (sometimes) her in the Cayman Islands, although I'd previously believed this was because our prey didn't move in the same speed or distance as normal bonefish prey (or the normal bonefish strip). Now I'm wondering if it's because of the pressure you mentioned. Interesting. Well, regardless, the first thing we have to teach our guests when fishing certain areas is to "feed the fish". Don't just robotically strip the fly as soon as it hits the water. Twitch it, slooowly, and then watch the fish for reaction.